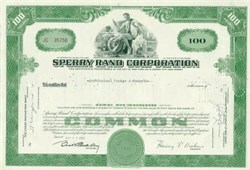 Beautifully engraved Stock Certificate from the Sperry Rand Corporation dated between the 1960's - 1980's. This company made the famous UNIVAC computer. This historic certificate has an ornate border around it with a vignette of the an allegorical man in a chemistry lab. The certificate has the printed signature of the company's officers and is over 25 years old. In 1955, Sperry and Remington Rand merged to form Sperry Rand. In 1986 Sperry Rand and Burroughs merged to form Unisys Corporation. 1999 Unisys unveils a comprehensive strategy and integrated portfolio of services, solutions and technologies to help our clients succeed in e-business. Unisys e-@ction Solutions enable organizations to take advantage of the operational efficiencies and growth opportunities of the Internet economy. Continued momentum of our business enables us to retire all 28.4 million shares of Unisys preferred stock, eliminating $106 million in annual dividend costs. Overall, we've cut our debt by $1.2 billion in less than two years. 1998 Unisys launches initiative to bring enterprise-class capabilities to Windows NT environments. As part of this plan, we announced Cellular Multi-Processing (CMP), which will bring such enterprise-class capabilities as high-speed I/O, partitioning, and cross-bar architecture to Intel-based Windows NT servers. 1997 Lawrence A. Weinbach named chairman, president, and CEO. Unisys Windows NT servers lead industry in price/performance. 1996 Unisys introduces ClearPath Heterogeneous Multi- Processing (HMP), enabling customers to integrate A Series and 2200 Series applications and databases with UnixWare and Windows NT applications and databases on a single platform. 1994 Services and solutions become the company's single largest business. 1993 Unisys introduces 2200/500, the first mainframe based on complementary metal oxide semiconductor (CMOS) technology. 1992 Unisys forms unit to deliver IT services. 1989 Unisys introduces Micro A, the first desktop, single-chip mainframe. 1986 Sperry and Burroughs merge to form Unisys Corporation. Sperry introduces 2200 Series, forerunner of the current ClearPath HMP IX system. 1981 Burroughs introduces A Series, forerunner of the current ClearPath HMP NX system. 1976 Sperry introduces first cache memory disk subsystem. 1965 Sperry introduces the 1108, the first multiprocessor computer. 1961 Burroughs introduces the B5000 Series, the first dual-processor and virtual memory computer. 1960 Sperry introduces the 1100 Series, forerunner of the 2200 Series. 1959 Burroughs pioneers use of magnetic ink character recognition (MICR). 1955 Sperry and Remington Rand merge to form Sperry Rand. 1953 Burroughs introduces first 10-key adding machine. Remington Rand introduces UNIVAC 1103, the first commercial use of random access memory (RAM). 1952 UNIVAC makes history by predicting the election of Dwight D. Eisenhower as U.S. president before polls close. 1951 Remington Rand delivers UNIVAC computer to the U.S. Census Bureau. 1950 Remington Rand acquires Eckert-Mauchly Computer Corp.
1949 Remington Rand produces 409, the worlds first business computer. The 409 was later sold as the Univac 60 and 120 and was the first computer used by the Internal Revenue Service and the first computer installed in Japan. See the Rowayton Historical Society's site for the complete story and pictures. 1946 ENIAC, the world's first large-scale, general-purpose digital computer, developed at the University of Pennsylvania by J. Presper Eckert and John Mauchly. 1928 Burroughs ships its one millionth adding machine. 1927 Remington Typewriter and Rand Kardex merge to form Remington Rand. 1925 Burroughs introduces first portable adding machine, weighing 20 pounds. Remington Typewriter introduces America's first electric typewriter. 1923 Burroughs introduces direct multiplication billing machine. 1911 Burroughs introduces first adding-subtracting machine. 1910 Sperry Gyroscope Co. founded to manufacture and sell navigational equipment. 1909 Remington Typewriter Co. introduces first "noiseless" typewriter. 1905 American Arithmometer renamed Burroughs Adding Machine Co.
1886 American Arithmometer Co. founded to manufacture and sell first commercially viable adding and listing machine, invented by William Seward Burroughs. 1873 E. Remington & Sons introduces first commercially viable typewriter.